Thousand Oaks, CA — A common concern among women considering a breast augmentation can be the inability to visualize the end result. Patients often have a hard time deciding which size and shape of implant will help them achieve their desired look. In an effort to aid in the decision-making process, Dr. Michael Schwartz, a board-certified plastic surgeon in Thousand Oaks, now offers his patients a virtual simulation technology called the VECTRA® 3D imaging system that allows women to view how their bodies will look post-augmentation. Dr. Schwartz says he is excited for the opportunity to provide such a state-of-the-art technology, and he feels the VECTRA® system will enhance each patient’s breast augmentation experience. In addition to breast augmentation, Dr. Schwartz offers a comprehensive range of cosmetic treatments and procedures at his center for plastic surgery in Thousand Oaks. From facelift and breast reduction, to liposuction and Ultherapy, he and his experienced staff utilize the most advanced techniques and technologies available. As a newer technology, Dr. Schwartz says the addition of the VECTRA® 3D imaging system directly aligns with his practice’s goals, adding that the insight gained from visualizing how different implant sizes will aesthetically enhance one’s body can help patients feel more comfortable throughout the entire breast augmentation procedural process. 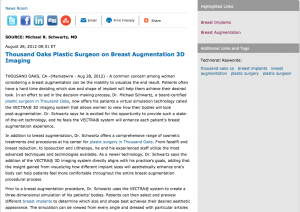 Prior to a breast augmentation procedure, Dr. Schwartz uses the VECTRA® system to create a three-dimensional simulation of his patients’ bodies. Patients can then select and preview different breast implants to determine which size and shape best achieves their desired aesthetic appearance. The simulation can be viewed from every angle and dressed with particular articles of clothing to give women an idea of how they will look in their garment of choice. Dr. Schwartz says he believes 3D imaging is a giant step towards the future of cosmetic plastic surgery and feels every patient considering breast implants should make this system part of their decision process. He adds that his current patients seem to be even more satisfied with their results because they were able to specifically pinpoint their goals in the pre-operative consultation. No matter what advanced technologies or techniques a practice may offer, Dr. Schwartz says women should always consult with a board-certified plastic surgeon when interested in breast augmentation, or any other cosmetic enhancement procedure. He says qualified surgeons provide ethical care and have completed the extensive education and training necessary to fulfill each patient’s aesthetic goals and desires. About Michael Schwartz, M.D., F.A.C.S. A graduate of Baylor College of Medicine in Houston, TX, Dr. Michael Schwartz has been serving the Thousand Oaks and Los Angeles-area communities in the private medical sector since 1998. He is a member of many prestigious organizations including the American Society of Plastic Surgeons, the American Society of Aesthetic Plastic Surgery, and the California Society of Plastic Surgeons. Dr. Schwartz is a large proponent of continued education and has delivered multiple presentations at the Mentor Masters series. He is also board certified by both the American Board of Plastic Surgery and the American Board of Surgery. Dr. Schwartz’s practice can be reached by phone at 805-435-8256, and is located at 696 Hampshire Road, Suite 210, Westlake Village, California 91361. He and his staff can also be contacted online at drschwartz.com or facebook.com/drmschwartz.